The Grand Sable Dunes are located north of Munising, Michigan off of scenic Highway 58. 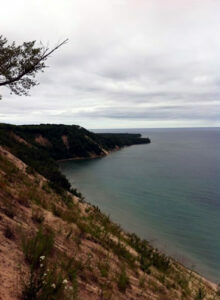 They cover a 5 mile stretch of coast along Lake Superior in the Pictured Rocks National Lakeshore. The massive dunes rise 300 feet above the water below. These beautiful sand dunes are more than just a great spot for a photo opportunity. They have an interesting history as well. 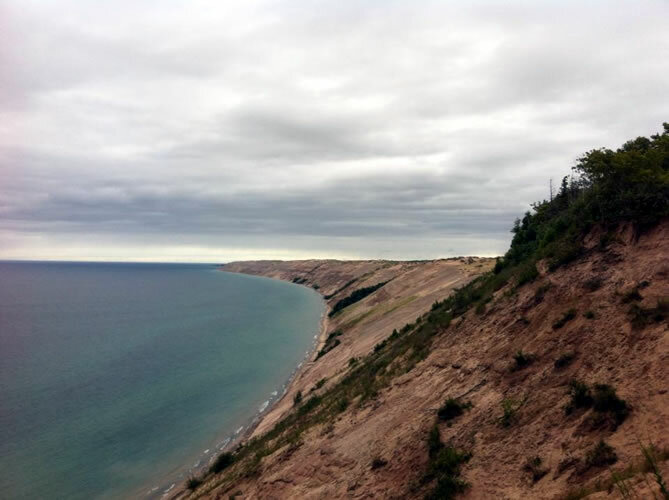 In the late 19th century, loggers in the area built a wooden log slide from the top of the dunes down to Lake Superior to make moving timber in the area easier to do. Legend even has it that logs sent down the dry log chute would generate enough friction to cause the chute to catch fire. There are leftover antiques from those bygone days and you can follow the interpretive trail toward the overlook to learn more about this area’s history. Once at the overlook the view is amazing! 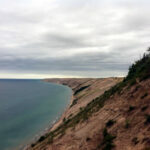 If you look to the west you will see Au Sable Point and the lighthouse that is located there. To the east you will see the Grand Sable Dunes stretch out for the next 5 miles. You can even follow the path old timber used to take to reach Lake Superior below. There is a caution however. While the hike down will only take you 5-10 minutes, the climb back up in the ever-shifting sand will leave you exhausted and can take up to an hour.